Pomegranate raita | Authentic Vegetarian Recipes | Traditional Indian Food | Step-by-Step Recipes | Give Me Some Spice! For centuries, Indians have been eating the pomegranate. I can remember eating them in Kenya as a child and being told how good they were for you. In the UK, at one time you could only get pomegranates in specialist ethnic stores. However, for the last few years, the Western World has caught on on the goodness of pomegranates and now selling them as a super food. In Kenya, we used to use the rind of pomegranate as a remedy against diarrhea. The juice was considered to be good tonic for you. We all love pomegranates and often add them to salads, shrikands and raitas. The sweet seeds add an unusual flavour to the dish. 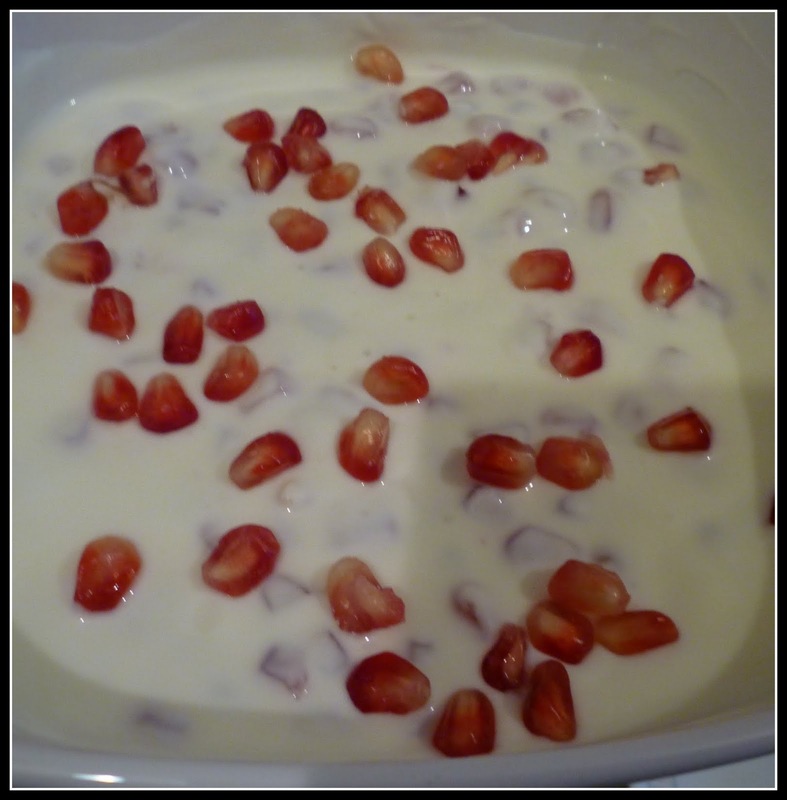 Pomegranate raita is a yogurt condiment flavoured with grated or finely chopped vegetables or fruit with herbs or mustard to enhance the flavour. In Gujarati mustard is called “rai”. “So a raita without mustard isn’t a raita” according to my dad and father in law! I used the ready made English mustard which is fairly mild. You can add as much or as little as you like. 1 -2 teaspoons of English mustard ( readymade). 1. Transfer yogurt to a mixing bowl. 2. Add the salt, mustard, chillies, coriander and pomegranates to the yogurt. 3. Mix well using a fork. 4. The raita is ready. Please keep it in the fridge until you are ready to serve.